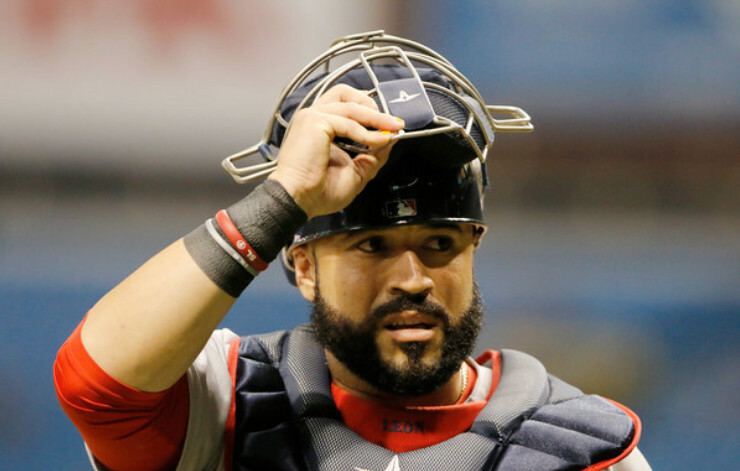 Nobody in Red Sox Nation was excited to hear the name Sandy Leon when the Nationals traded the catcher to Boston for cash considerations on March 30, 2015. Hardly ever do the words “cash considerations” in a trade generate any kind excitement in a fan base. When the Red Sox picked up Leon (pictured), we were just beginning to deal with the devastating news that Christian Vazquez, our next JasonVaritek, was headed for Tommy John surgery. That was devastating news for all Sox fans. Even at a young age, the kid called a great game in his 55 games in 2014. He completely shut down the opposing team’s running game. He picked off runners on first like it was nothing. Vazquez even showed a little potential at the plate. Really, there was nothing not to like about the young catcher. You don’t want to say a player injury is a good thing, but it turns out that injury to Vazquez was definitely a blessing in disguise for the Red Sox because it brought Leon to town. That was apparent long before Leon’s three-run, walk-off shot in the 12th inning Wednesday night. Leon has been everything we had dreamed we were getting in Vazquez, and then some. Despite the catcher running through Brian Butterfield’s stop sign and getting thrown out at home to end the third inning, Leon made an impact throughout Wednesday’s victory. Following his great debut with the Red Sox, Chris Sale, perhaps being a bit overly humble, pointed to the man behind the plate. Sure, Sale clearly deserves more credit for his performance, but Leon’s work as Red Sox pitchers hurled 12 shutout innings Wednesday night cannot be overlooked. Coming into the season, Leon, who has thrown out 41 percent of base stealers, had a career 3.64 catcher’s ERA. That’s not the most telling stat in baseball, but it means something. So does Leon’s .310 batting average in 78 games with the Red Sox last season. Varitek never even hit .300 in Boston, and Leon seemed like he hit about .850 in the clutch. Vazquez missed the entire 2015 season, and he clearly wasn’t 100 percent when he returned last year. While he was lauded for his pitch framing and he could still throw out runners (though not as impressively as before), Vazquez appeared overmatched at the plate. The young catcher hit just .227, and he struck out way too much. So, the Red Sox turned to Leon, and it appears he has cemented his status as the starter. For many of the same reasons Red Sox fans were excited about Vazquez, they should be just as excited about Leon. Since Leon never really showed signs of hitting like that in the minors, there was some worry that 2016 was an anomaly from the catcher. But after a strong spring training in 2017, Monday’s bunt and Wednesday’s blast, Leon seems poised to show that 2016 was not a fluke. At 28, Leon is less than two years older than Vazquez, and he is just entering his prime years. Now, the fourth Molina brother is a great insurance policy for the Red Sox or, possibly, a great trade chip with Blake Swihart catching again in Pawtucket. As we start the 2017 season of great expectations, the name Sandy Leon definitely has Red Sox Nation abuzz. time the Red Sox acquire a player for cash considerations.